It may be hard to remember now, but there was a time when The Social Network — at one point, more commonly known as “The Facebook Movie” — seemed like a really bad idea. What could they possibly make a movie about here?, we asked one other while chuckling and detagging drunk photos of ourselves. Aaron Sorkin, of course, ended up twisting the whole thing into an epic story of betrayal and greed and fast-talking, and copped a rightly deserved Oscar for his efforts. 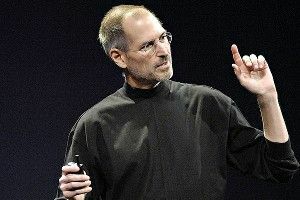 Later, he’d famously say that “fundamentally, you could tell the same story about the invention of a really good toaster.” Well, Aaron’s back in the tech-genius movie game, with a more famous toaster-invention story on his hands: Sony has hired Sorkin to adapt Walter Isaacson’s biography, Steve Jobs. According to THR, Sorkin — whose next project is the HBO show The Newsroom — was always Sony’s first choice (obviously), and was being courted as far back as November. Adds Sony Pictures co-chairman Amy Pascal, “Steve Jobs’ story is unique: he was one of the most revolutionary and influential men not just of our time but of all time. There is no writer working in Hollywood today who is more capable of capturing such an extraordinary life for the screen than Aaron Sorkin; in his hands, we’re confident that the film will be everything that Jobs himself was: captivating, entertaining and polarizing.” Pascal seems to be hinting that the flick won’t be pulling punches in an attempt to portray Jobs as he is now, completely revered, but will show the guy in full. It’s a tall order even if Sorkin didn’t have decades of content to deal with here — Jobs’s early struggles in his garage, his exile from Apple, his return to to the company and eventual glory. Counterintuitively, Social Network may have been an easier feat to pull off: Yeah, it did seem like there was no particularly interesting story to tell, but dealing with a shorter time frame and the less-adored Zuckerberg minimized some of the issues Sorkin is going to face with Jobs. (And biopics always tend to be a bit messy.) So, yes, beyond the whole “ambitious tech genius” angle, Social Network and the Jobs movie will probably be radically different. And seeing how, exactly, Sorkin tackles the Isaacson book should be pretty fascinating. Meanwhile, there are Ashton Kutcher’s feelings to consider. If you recall, Kutcher landed the lead role in the indie Jobs, a biopic looking to break off a smaller chunk of the man’s life, back in April, to the consternation of thousands. There will be no competition, though, not really. As THR makes clear, “Sony is clearly in no rush with its project, believing that pedigree will be one of its distinguishing factors.” In other words, Ashton, Sony would like to tell you good luck with your little movie, but your Jobs movie is the Deep Impact/Volcano/Gordy to their Jobs movie’s Armageddon/Dante’s Peak/Babe.